UPDATE: Time to add a 5th premiere to the World Tour - Russian distributor Disney have announced (via Kinometro) during their presentation at the St Petersburg KinoExpo on Wednesday that they will be bringing Jennifer Lawrence and "her two boys" to Moscow, Russia. The date of the premiere is to be confirmed, so stay tuned! Lionsgate today have announced the first set of locations and dates for the Mockingjay - Part 2 World Tour, alongside brand new stills! Be the 1st to know our #MockingjayWorldTour stops! 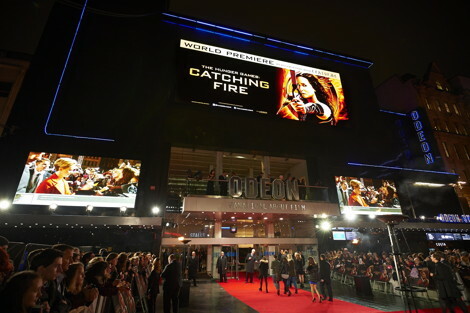 Follow @jhutch1992 @liamhemsworth @Hibbits @ninajacobson throughout the day! The world premiere will take place on November 4 in Berlin, followed by a premiere in London (at the ODEON Leicester Square) the next day! Then the following week the cast go to Paris on November 9 and end with Los Angeles on November 16! These dates are just for premieres with all of the main cast and Nina and Francis - there will be other locations for press events (remember Seoul and Beijing plans last year) and fan greet events and smaller one-cast-member screenings - we will keep you updated on those, so stay tuned!